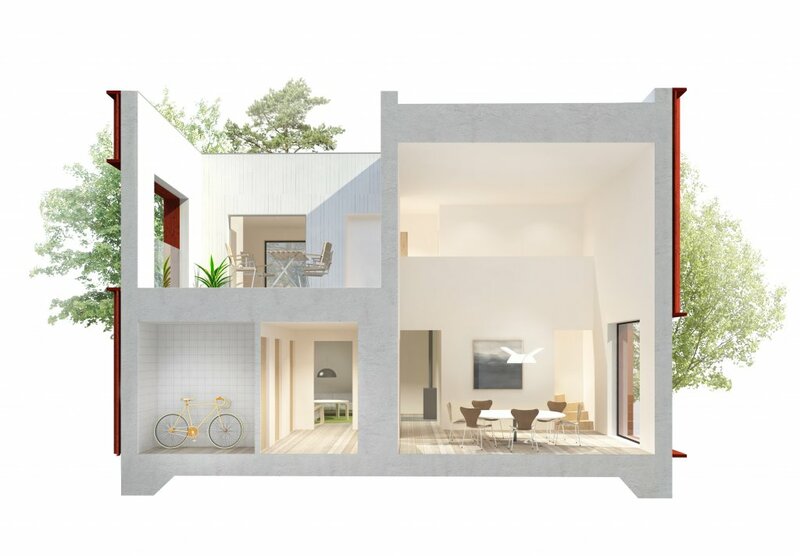 A home built by two million Swedes, the Hemnet Home is a data experiment to lead the way for a new type of architecture. After analyzing 200 million clicks and 86 000 properties on Hemnet, Sweden’s most popular property site, Hemnet asked Tham & Videgård to create Sweden’s statistically most sought after home. The house is in short based on two parts. A direct interpretation of Big Data statistics from all the Hemnet users gave an average value that determined the measurable properties of the home including size, price, number of rooms, bathrooms and floors. To this Tham & Videgård have added a reading of the Swedish house condensed into two iconic types: the red wooden cottage that represents history, local resources, crafts and national building traditions, and the white functionalist box which stands for modernity, optimism, industrial development, the welfare state and international ideals. The aim was then to create an architecture that combines the statistics with the features of the two iconic types – the rationality of the functionalistic box combined with the quality of craftmanship and material presence of the Falu red cottage. 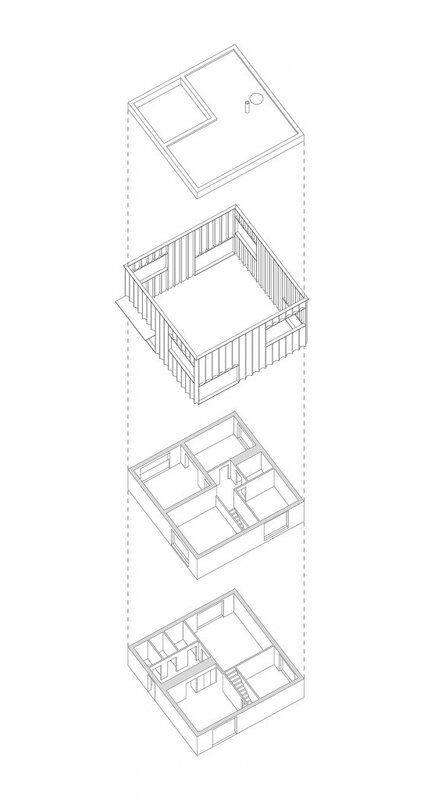 The result is partly a mathematical translation of the statistical 1.5 floors within a cubic volume that is fully utilised by fitting in a terrace and a double height void on the upper level. 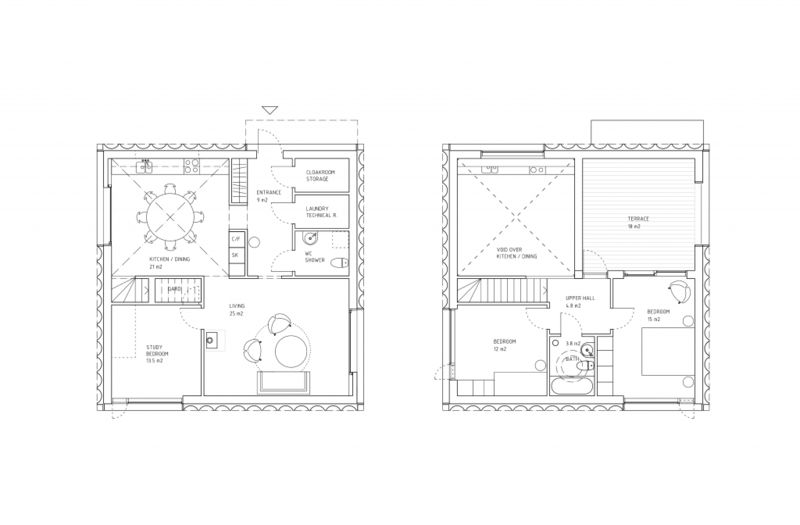 This corresponds to statistics which indicate a desire for a balcony / terrace and an open kitchen, which Tham & Videgård have interpreted to make the kitchen one of the home’s most important social spaces, emphasised with a double floor to ceiling height and the inclusion of space for both dining and stairs. A terrace is inscribed within the cube and thus provides a sunny terrace protected from the wind and also offering privacy. This is beneficial, particularly for denser housing areas. The kitchen’s extra floor to ceiling height together with one large window placed in each room combines into a simple and energy-efficient construction filled with generous daylight and a spacious interior. The facade is made of standard wooden boarding mounted on a curved nailing batten to achieve a well crafted character and material presence inspired by the heritage of carefully detailed timber architecture. The wave shaped facade panels create an enhanced depth and shadow effect. 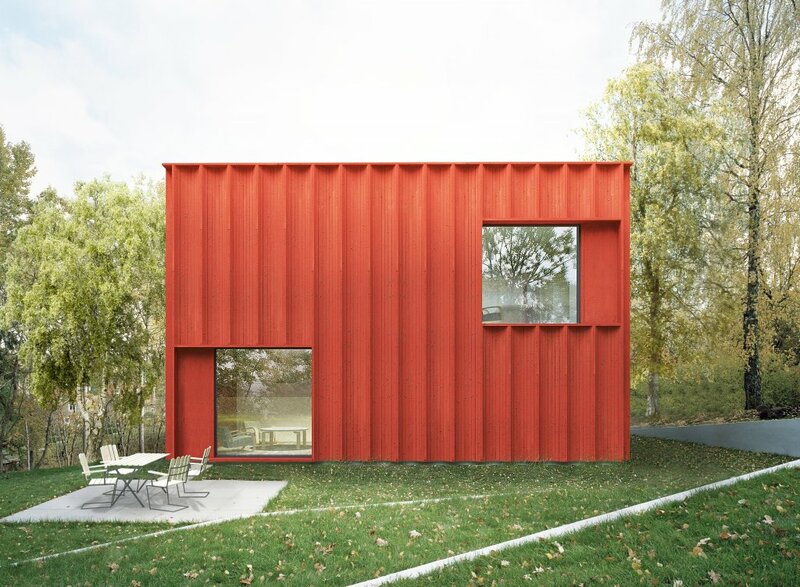 The exterior is painted entirely with traditional Swedish Falu red colour.